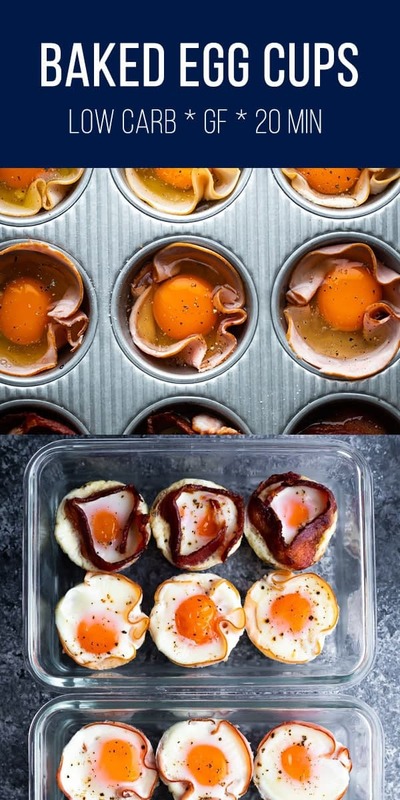 Meal prep baked eggs in a muffin tin! 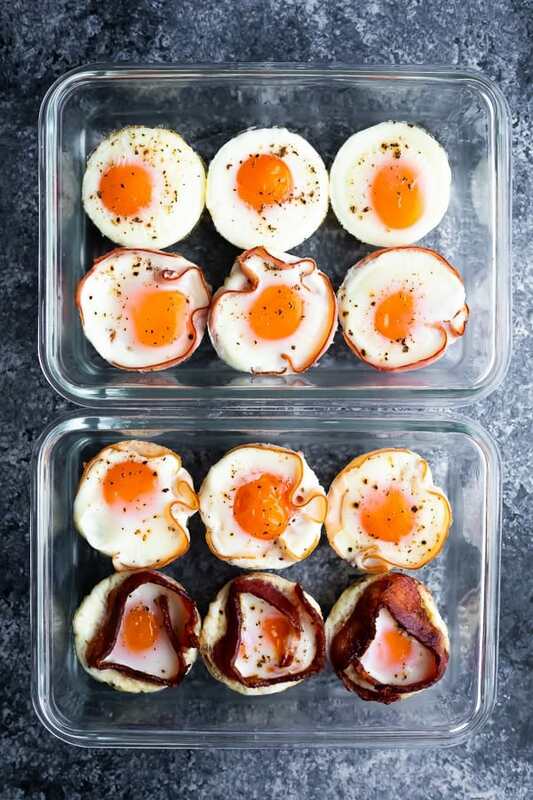 Bulk prep your eggs for easy breakfasts in the morning. Low carb, gluten-free, and ready in under 20 minutes. Breakfast was one of the very first meals I started meal prepping because I found myself skipping breakfast in my morning rush. Then I’d grab a sugary coffee shop muffin and crash mid-morning. Total disaster. If only I’d known about meal prep sooner! Today we’re talking baked eggs. If you are looking for scrambled egg muffins, check out my 7 breakfast egg muffin recipes here! 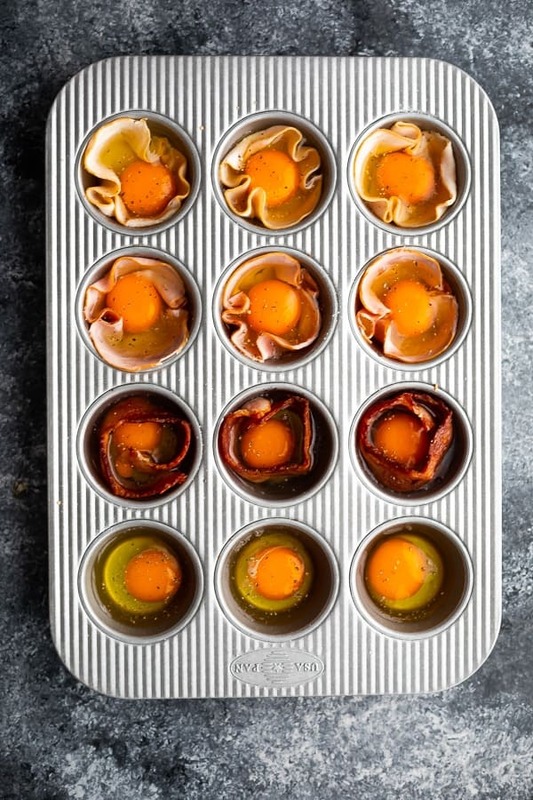 These baked egg cups are made in a muffin tin, and can be as simple as a single egg, or you can jazz them up with some bacon, ham or turkey. 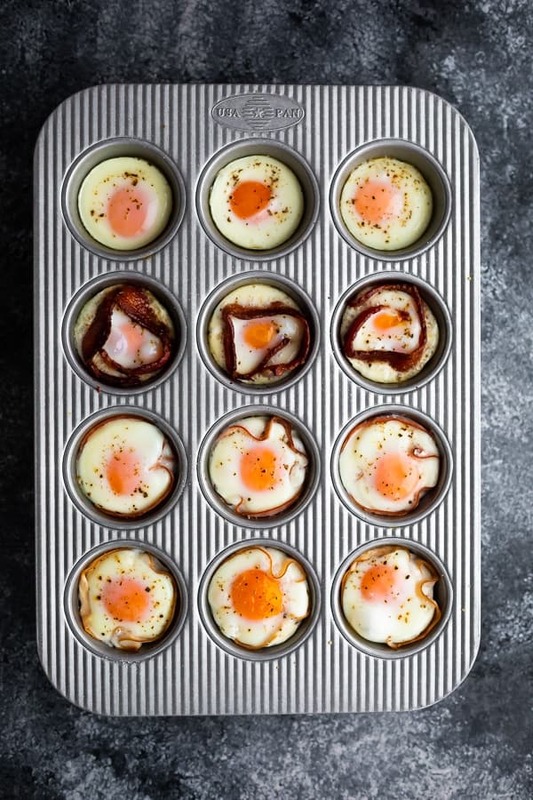 The best part is you don’t even need a bowl, just crack your eggs right into the muffin tin and bake them up! For this recipe, you need a muffin tin, some spray oil, eggs, salt and pepper. That’s it! Ta da! Easiest eggs ever. 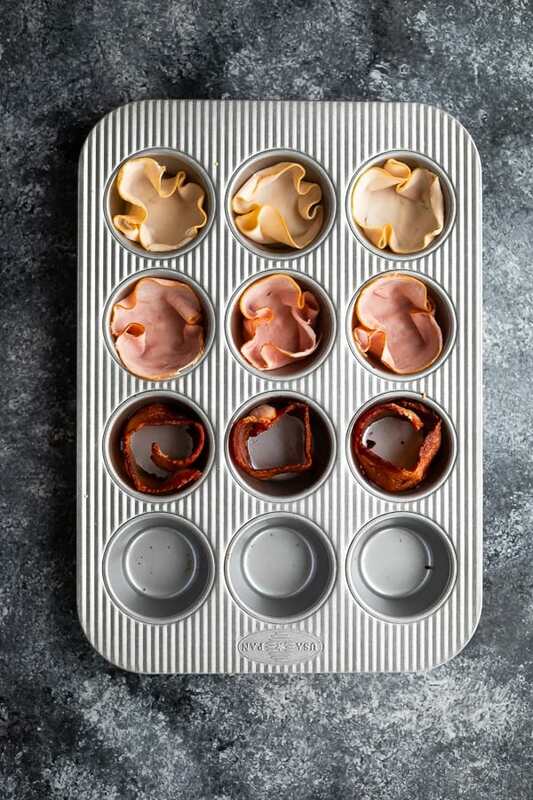 I also included some options to bake the eggs in a slice of ham, turkey or a slice of bacon (wrapped around the muffin tin). So so easy and an extra boost of flavor and protein. Are these oven baked eggs soft or hard boiled? Depends how long you leave them in the oven. 15 minutes gave me nice, soft, jammy eggs, whereas 18-20 were more cooked through and closer to hard boiled. How long do these oven baked eggs last for? Store in a sealed container in the fridge for up to 4 days. You can freeze hard boiled eggs for longer than that…I’d go up to 1 month. Can I add veggies to my baked egg cups? Yes! You can layer shredded potato or sweet potato as a ‘hash brown’ crust. You can also sprinkle the eggs with fresh herbs or chopped spinach before baking. 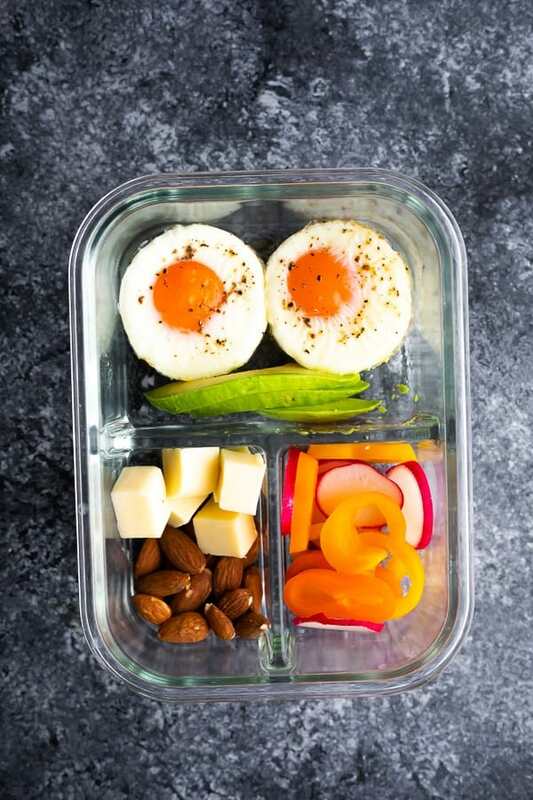 Since this is a low carb breakfast option, I thought it would be helpful to throw together a simple low carb breakfast bento box! Spray a standard-sized muffin tin with spray oil. 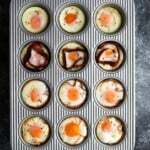 Carefully break the eggs right into the muffin tin, or into a small bowl, then pour into the muffin tin. Bake for 15-18 minutes, until eggs are done to your liking. Reheat in the microwave or enjoy cold!